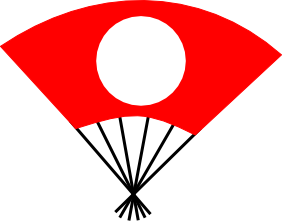 A simple folding fan design with the sun-circle motif was used by Satake Yoshinobu at the Battle of Imafuku in 1614, in the early Edo period. 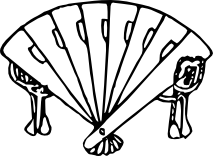 (SH:H9,62) This style of papered fan, optionally with design, became the standard version of the folding fan for mon. 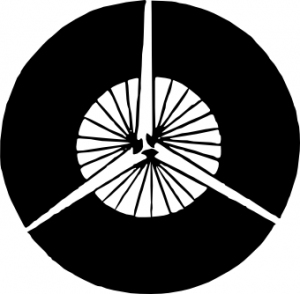 This particular version is interesting because it breaks the standard two-color rule for mon, which would soon become inviolate, by using three distinct colors: black, white, and red. 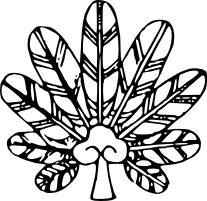 Around the same time, we have a three-fan design used by Matsudaira (Okochi) Nobutsua, who we mentioned last week, at the Shimbara Rebellion in 1638. (SH:63) Making circles of fans is similar to the way circles would be made of some plants in mon.